The Scottish winter season usually throws up a few surprises. 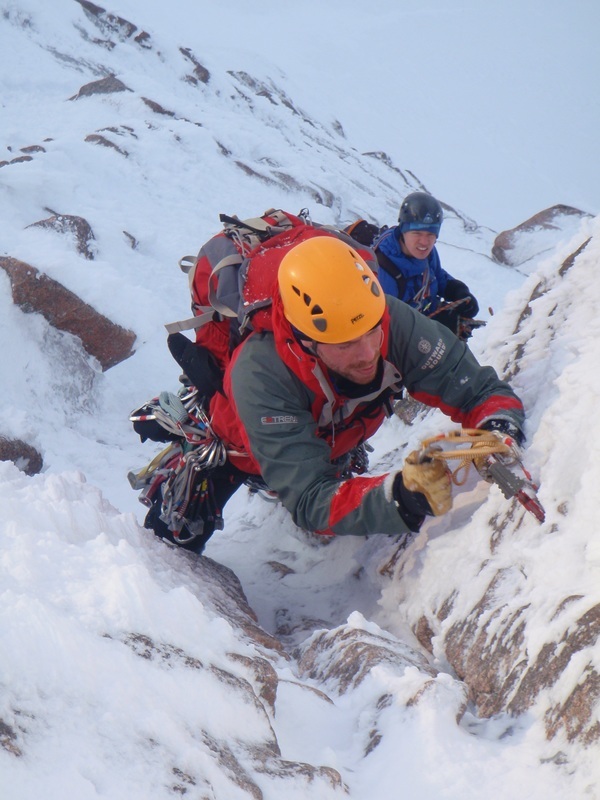 Last year copious amounts of unconsolidated snow made climbing hard work. Protection was difficult to find and usually required lots of digging. The general theme was go steep and bold! However finding and building secure belays is a key part of everyone’s winter climbing apprenticeship and the foundation for staying safe. A solid grounding in placing summer rock protection forms the basis for good anchors and runners in winter. They are generally stronger than those placed in snow and ice with all their variability’s. Work through your options of rock gear (nuts, hexes, slings), ice screws and snow anchors in order of decreasing security. When looking for opportunities for gear be logical with your evacuations. Look in corners, behind lumps. If you find a crack follow it to it’s bitter end. It may just give that perfect placement. Any ice or crud in the crack will have to be cleared otherwise any gear you place can melt out under pressure. Get busy with your pick and prep that placement. Give nuts a tap with your axe to help them sit more securely. After all your hard work you don’t want them to be lifting out as you move away! Friends can work well in winter on dry rock but any ice in the crack can cause spectacular failures. For this reason the iconic hex is still many climbers preferred weapon of choice. A size 11 hex hammed deeply into the depths of an icy crack is still one of the most reassuring sights to the lonely leader. In summer the ‘coffin rule’ gives a good rule of thumb for the security of blocks. If it’s big enough to be your casket then it should be good for an anchor. Things get a little more complicated in winter where even the smallest blocks can provide a good placement if well frozen in place. 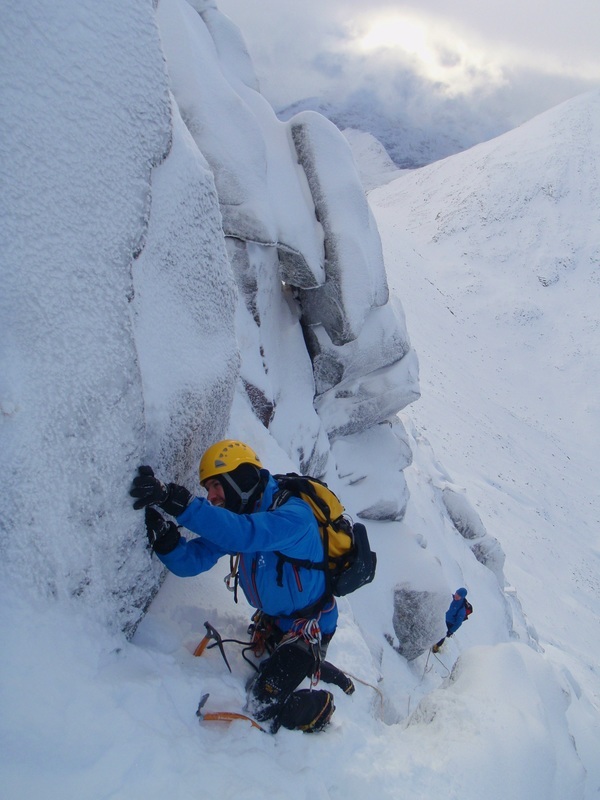 Keep yourself and your second safe but get your ice axe in behind and give it a good test before committing yourself. The dying art of placing pegs still belongs in winter climbing. Many popular routes will go without but sometimes they’ll be your only option especially in icy conditions with the rocks coated in verglass. Getting the right size means you should be able to place around 50-75% of it’s length into the crack by hand. Then it’s hammer time. Listening for a rising ringing tone which indicates a good placement. There are also many in-siteu pitons dotted around the mountains. Give these a good tap with your hammer and use your judgement before trusting them. Ice screws have developed beyond all recognition. From the first drive in Warthogs and Snargs came the basic screw which needed two hands and the leverage of an ice axe to place. Now modern screws can be placed in seconds with a one hand. Get yourself comfortable with a good stance and hanging from a straight arm. Try and get at least one foot flat to stave off that all too familiar calf pump. It’s best to place them at waist height to increase your leverage and decrease the pump. Prep the ice ready for your screw by clearing any rotten crud and tap a little guide hole. Jab the screw into the ice and once it’s bitten twist it all the way in. The quality of the ice core that protrudes will give a good indication of how strong the ice is. The amusingly named Abalakov Thread was named after Russian climber Vitaly Abalakav. It involves drilling two intersecting holes in the ice which can be threaded with abseil tat to provide a very strong anchor. Perfect for abseils as you get to take your expensive ice screws with you . Snow bollards and bucket seats are the staple of the winter mountaineer for enjoying the many classic grade 1 gullies on offer. Surprisingly strong the principles of a braced stance hold true for what ever anchors you’re using. Bollards also make a very good anchor for retrievable abseils for checking out a slope or dropping in over a cornice. Persevere. It may take as long to build a good belay as it did to lead the pitch but being safe is compulsory. Remember digging is fun!